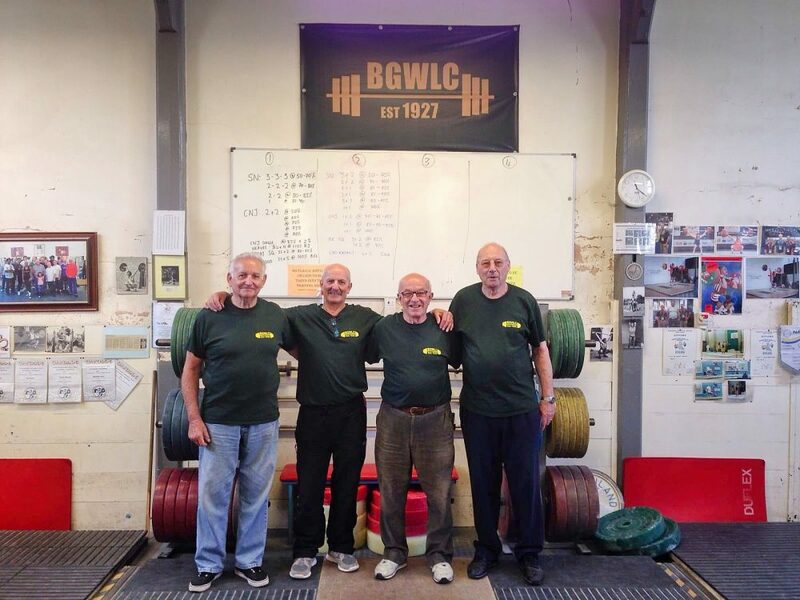 Weekly weight Training sessions at gym in Bethnal Green for men over 55. Tuesday 22nd January 2019: 14 members of The Geezers Club went to the brilliant exhibition of the 100 year-old photos of suffragette, Norah Smyth. The exhibition was held at Four Corners, 121 Roman Road, London, E2 0QN. Norah Smyth’s top quality photographs provide wonderful documentary evidence of the activities of the East London Federation of Suffragettes. You can see lots of the photos with informative captions in this Guardian review. Wednesday 23rd January 2019: Visit to the Pembury Tavern, Amhurst Road, Hackney for a charity night. The Five Points Brewing Company organised a charity event in aid of Headway East London, which provides aid to those affected by brain injuries. From Connect Four to Dominoes, participants indulged in some old-school, brain-stimulating board games and had fun finding out more about the charity. This was of particular interest to one member of The Geezers whose Stepson has brain injury. There were four Bow Bowls Sessions on Mondays 7th/ 14th/21st and 28th January 2019. Friday 22nd February 2019: Geezers enjoy watching West Ham United. 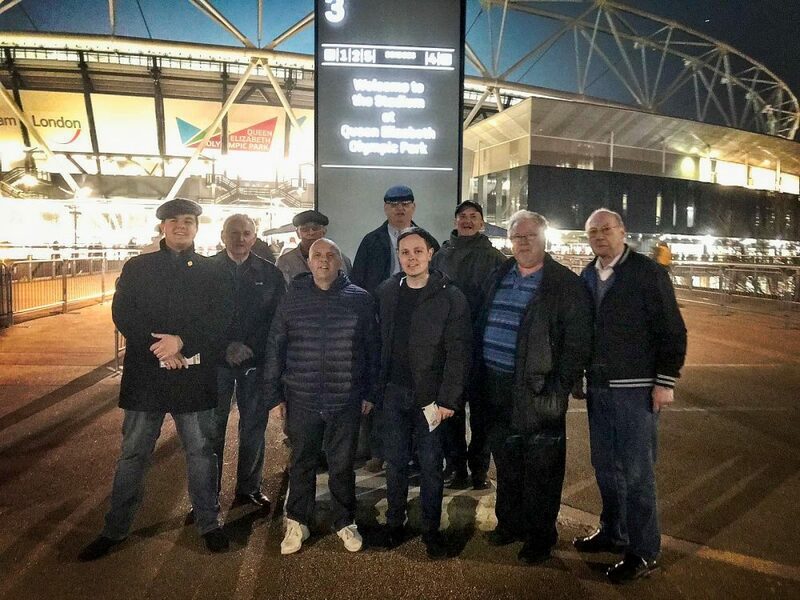 The Geezers had a great local night out at the London Stadium. 59,950 spectators packed the Stadium on the edge of the Olympic Park to watch West Ham United play Fulham. Back row: L-R Geezers Don, Ray, George, & Ricky. Front row: Chad, John, Jack, Barrie & Brian. 2 new members joined The Geezers Lawrence Kinsella and Dave Taggart joined 26th February 2019. Weekly weight Training sessions at gym in Bethnal Green for men over 55 as usual. 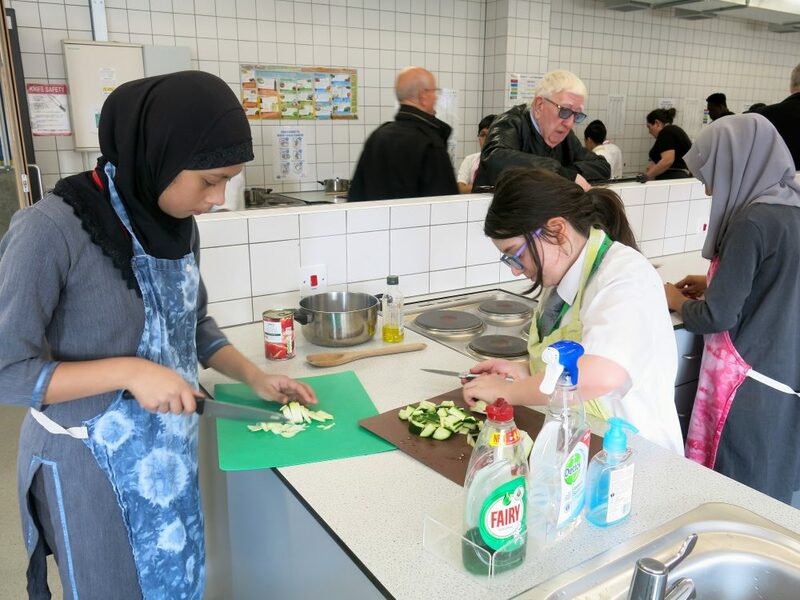 Friday 29th March 2019: Bow School / Space Studio combined Gardening and Cooking Event. 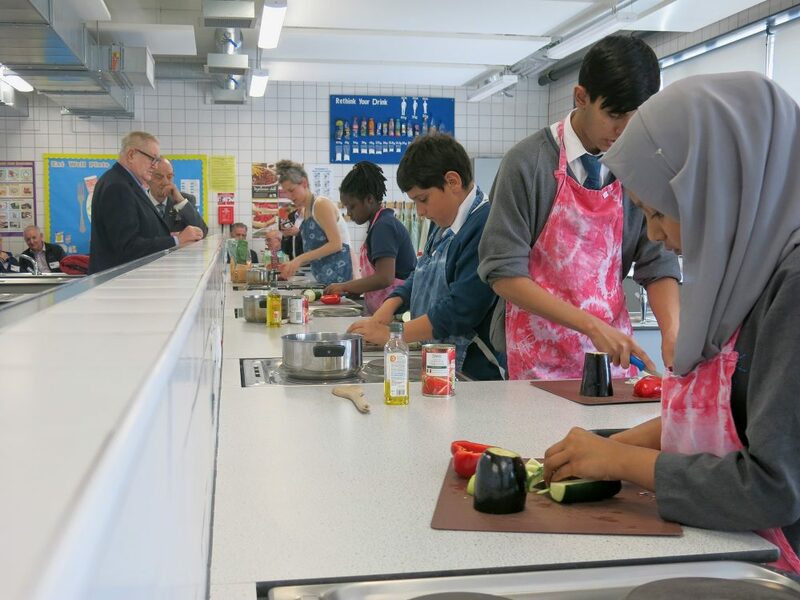 The Geezers were invited to a lunch at Bow School via Space Studios. 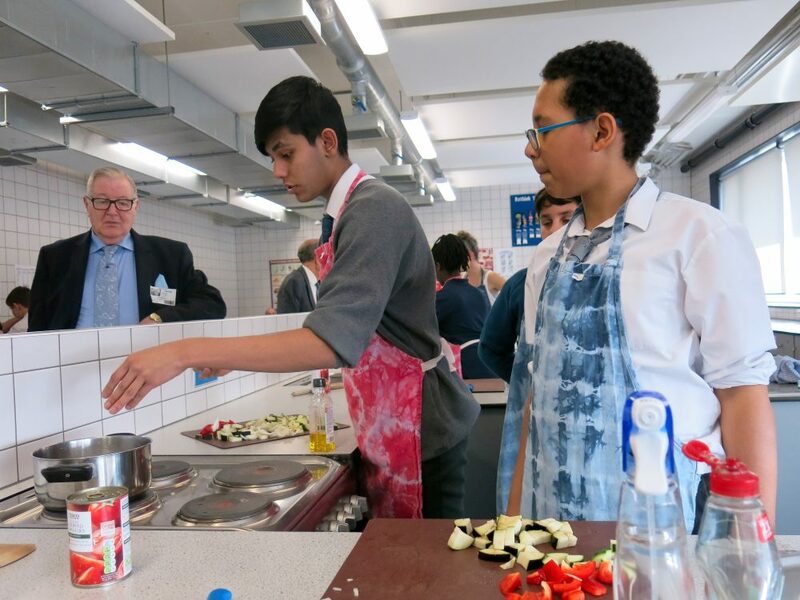 Ratatouille was cooked by year 11 students, 13 members of The Geezers attended and had a great meal. Tuesday 8th January 2019: Today’s visitor was Chihiro Masui a Japanese Public Health student. She has been studying in England at University and looking at how clubs for elderly men could be run in Japan. Chihiro wanted to use The Geezers as an example. There were lengthy exchanges between Geezers members and the young student regarding how things are in Japan for elderly men. She said she had learnt a lot from The Geezers and would love to return, which we agreed. Tuesday 15th January 2019: Visitors today were Lindi Peat from the DLR organising trips, and Ruth Cranford – a nurse organising individual trips to stop loneliness called Back On The Block. The Geezers agreed to trips when the weather was better. 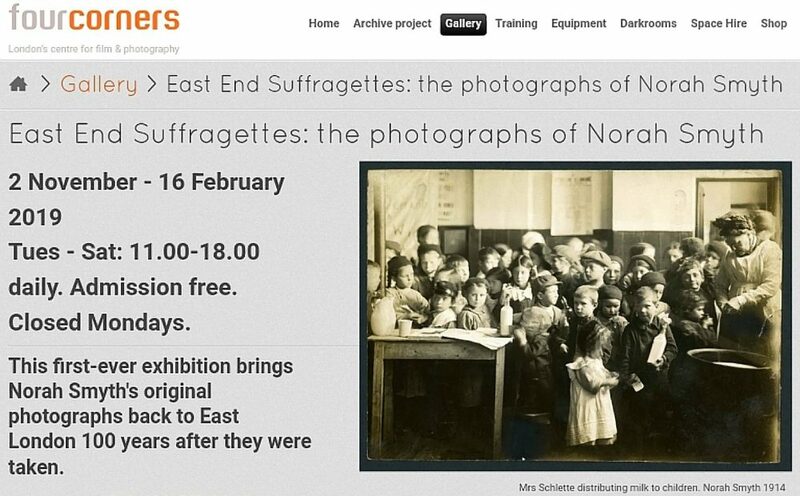 Tuesday 22nd January 2019: No visitors to club today as on an outing to 4 Corners East End Suffragettes Photo Exhibition. Tuesday 29th January 2019: Visitors today Fahima Kantus and Bethany Hodgekinson from ‘Home Care Providers’ a care environment for dementia sufferers. They were presenting the practice of home care ‘Home Instead’. Fahima gave a very informative talk about dementia, its diversity, and reality of living with it. We were given a practical quiz exercise. Two members of Age UK East London Amina Begum and Caroline Dane. 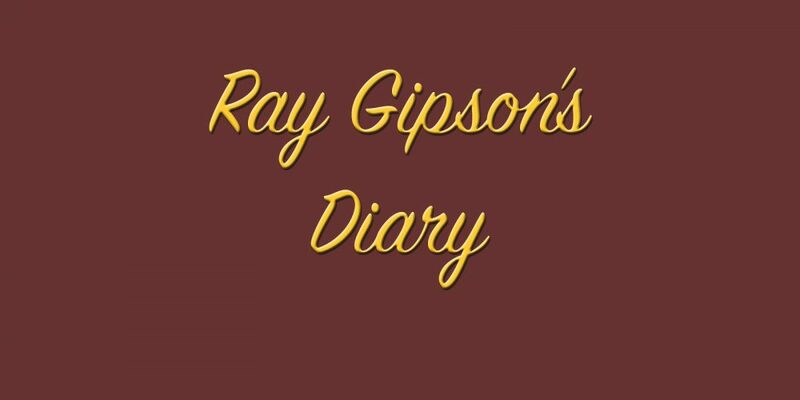 Christine Hevey who had worked with Ray Gipson on the council brought in 4 people from Clarion Housing:- Samia Altaf, John Ball, Patrick Hughes and Helen Wilson. The main visitors for the day were on the back of The Environment Magazine Active Energy Project featuring The Geezers and published in the February. Eleven members of CIWEM (the Chartered Institution of Water and Environmental Management) plus the Editor of The Environment magazine attended – Terry Fuller, Sarah Anderton, Alastair Chisholm, Sophie Dunajko, Olivia McLaughlin, Heather Gardner, Sarah Farache, James Anderson, Vicky Harris, Karen Thomas, Barbara Woods, and Lujane Al-Shainani. 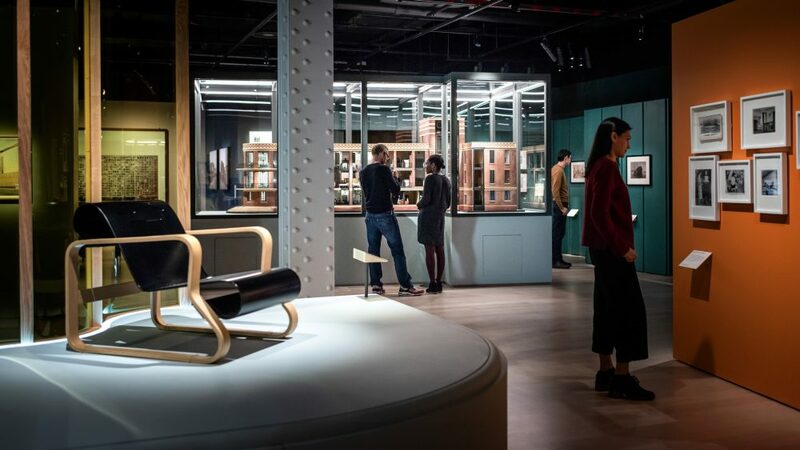 Tuesday 12th February 2019: No visitors today as at Wellcome Collection. In Kate Angus’s sick leave absence Age UK East London’s Caroline Dane came into watch the meeting. The main Visitors today were Becky Driscoll and Linda Tai from Tower Hamlets Council speaking about living with cancer and the quality of life. They had suggestions of things you could do to improve your life circumstance whilst living with cancer. They said they had £1 million from Macmillan Cancer, they spoke to The Geezers about their experience of living with cancer themselves or with family who had it. Many of The Geezers had or where experiencing this and gave their story to the visitors about this experience. Tuesday 26th February 2019: Today’s visitor was Zack Ahmed from Tower Hamlets Council Public Health came in Dr Radhika Puri’s absence, he spoke about Public Health, Chicken Shop hygiene problems, and fast food causing diabetes. He struggled against the ever-chattering crowd unfortunately, and had a job getting a word in edge ways, he did remarkably well given the circumstances. Dr Radhika Puri will arrange another visit soon. Tuesday 5th March 2019: Today was The Geezers AGM so no visitors. Tuesday 12th March 2019: No Visitors today due to very windy weather. Our second visitor was Caroline a ULC Post Graduate Student who is doing a project about Victoria Park. She wants to produce a book on the history of Victoria Park and why it matters to local people. She spoke to Geezers individually re their experience and knowledge of what park used to be like and wanted to hear any anecdotes. Geezers suggested that she contact Mile End Archive and History Library as a former member of Geezers, the sadly deceased Terry Bloomfield, lived in a house overlooking the park and donated dozens of photographs of the park to the archive. Tuesday 26th March 2019: Today’s visitor was Christine Lee a long-term worker of Age UK East London, who is leaving her employer. Christine has known and worked with Geezers for many years and came in to say her goodbyes. Enter your email address to receive news in and around Bow from the Geezers (that's all we'll use it for).